In Madden 17, Franchise Mode has had the overhaul that people have been begging for. If you are a CFM player like me then you will have seen the twitter feed for it and got excited about the blogs that were going to be released. 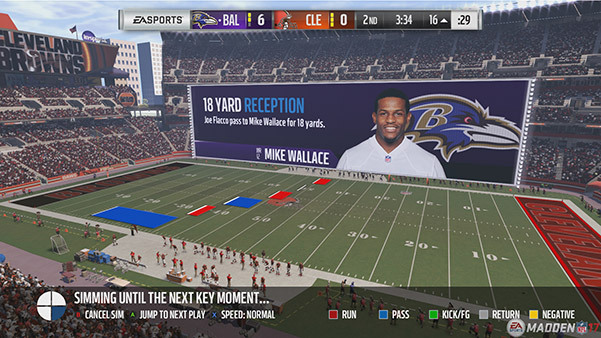 Well, in case you’ve since missed the information about the new features, you can read all about them here: EA Sports Madden 17 Franchise Features. Play the moments: EA have added this to the mode so that if you are short of time then you can still live the life of a career, by only playing selected moments of games. 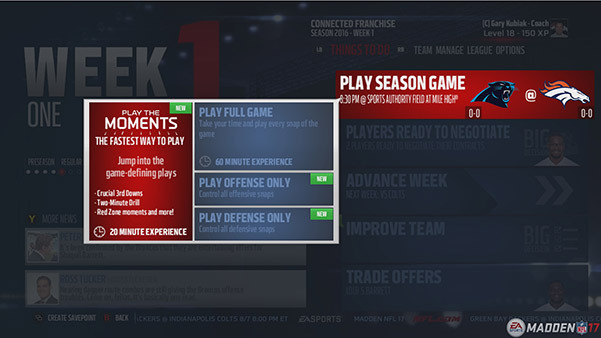 Selecting this means that the game will be simulated until it detects a key moment in the game (be that a crucial 3rd down, 2 minute drill to get down the field and score the game winner, or to defend your line and stop the op position scoring) if you don’t want to play that moment then you can skip it easily. As well as only playing particular moments, you can select to only play on one side of the field (meaning you can just attack or defend). The best bit in my eyes is that you can switch between modes during the game. So if you are just firebombing the opposition you can move to Play the Moments, and only play a few more downs. Super Sim: Super Sim incase you haven’t used it before is an option so you can sim to the end of a quarter, half, game or if you just want to skip a few plays. EA have tweaked it so that it balances out much better, meaning that you get the same number of plays off regardless of how long your quarters you play are. Simulation Speed: The speed that the games move now are pre determined by you. There are 3 speeds of simulation. You’ve got the “just get it over and done with” fast option, the “I want to know what happened” normal option, or new to the mode “I want to watch how the play unfolds” meaning you can watch the play on the broadcast camera live. Game planning: This is where things in my eyes start getting to give you a more realistic mode (if you enjoy those things) before your weekly game you’ll be told what the tendancies are of your opposition and you will have the opportunity to practice plays to counter those and in game you will get a team boost for the plays that were practiced. 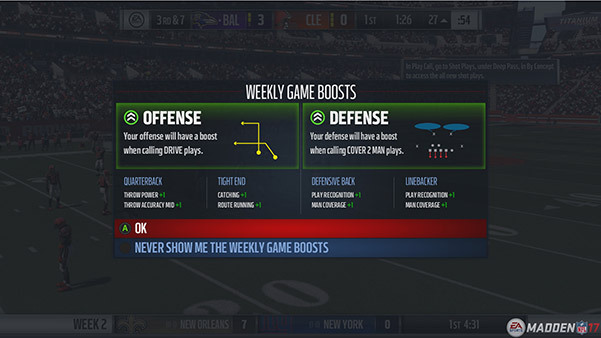 Each week you are going to be able to choose an Offensive & Defensive gameplan. The initial gameplan is determined on your opponenet but you can change it to suit. Then you have a little in-game drill that will show you how to succeed, based on that performance your team gets XP points and in-game boosts for your players. The thing that I really liked about this was that Madden now takes into account the relationship between position groups, so if you chose a passing gameplan then your QB & WR groups get the boost- a rushing gameplan is a benefit for the HB & OL. The way it is presented in game is to highlight the plays that you worked on highlighted in green when you are in the play selection screen. 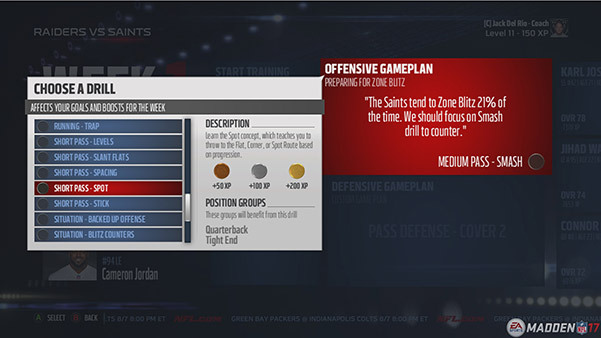 Tendencies: As well as gameplanning for you opponent you get given information on the tendancies of the teams you are facing, meaning if the team you are playing against blitz a lot, or play zone then you can easily see this and choose plays that you think will exploit that. 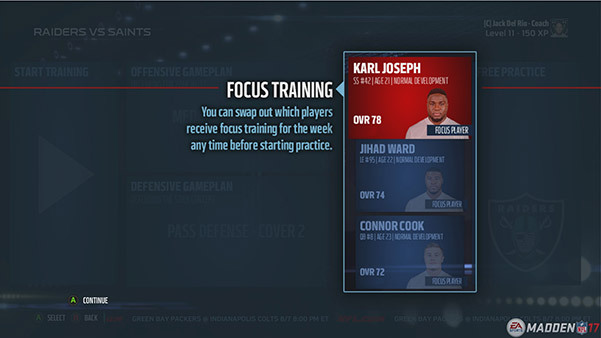 Player Focusing: This allows you to choose 3 players to focus on each week. These gain extra XP during the week, these are defaulted at the end of each year to be the top 3 players you picked in the draft, but you can select whoever you want. Overall, the features that they have released sound pretty good. They give users the opportunity to make real decisions for the future of their franchise with the opportunity to play the bits that you enjoy, as well as making the off field improvements to help bring the mode a new level of realism. There’s so much more to say on this so keep an eye out for Part Two but what I’ll end with for now is that being able to choose plays that will exploit the opposition is a big part of the NFL and I’m really happy they included that.